This past week the CSA (Community Supported Agriculture) commenced for the season. The first bounty was absolutely gorgeous…. boston red lettuce, turnips, radishes, strawberries, just to name a few. The produce is picked the same day as delivery. Have you ever eaten food the same day as it’s picked?? It’s so fresh, crunchy and flavorful. The essence of the produce really shines the fresher it is, needless to say that the nutrients are at its peak as well. Often when you belong to a CSA, especially in the Northeast, there is a limit as to what can grow here. The CSA I belong to is a 26 week season and there are normally about 8 different items, give or take in my weekly share. Given that, I have to supplement with a few other items and shop at my local food market to complete my meals once in a while. Like this week I received french breakfast radishes. 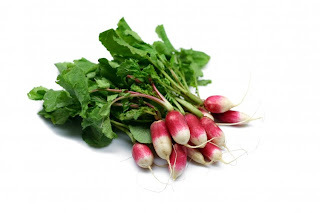 Those are the radishes that are elongated with pink and white roots. It is eaten raw as an appetizer alone or chopped into a salad. I had this recipe in mind for the radishes, which looked so fresh and appetizing when I eyed it the Martha Stewart Living, May 2010 edition. I needed to add some ingredients that I did not have on hand, but they are in season… like cucumbers and mangos. I am glad that I tried this recipe…. it was even better than it looked. The lime dressing and zest along with the sugar really brought out the flavors to a perfect ensemble. A sweet citrusy and fresh salad that is so crunchy, your head just might shake. I was not the biggest fan of radishes at first, because it tends to be a little too spicy and bitter for me, but this was not the case at all. The radishes were a welcome addition with the mango that offsets any bitterness. The bright colors of this salad represents the vibrant flavors. Arrange mango, cucumber, and radishes on a platter. Whisk together lime zest and juice, oil and sugar. Season with salt. Drizzle dressing over salad, and season with salt again.